Remember the Test in Step 1? 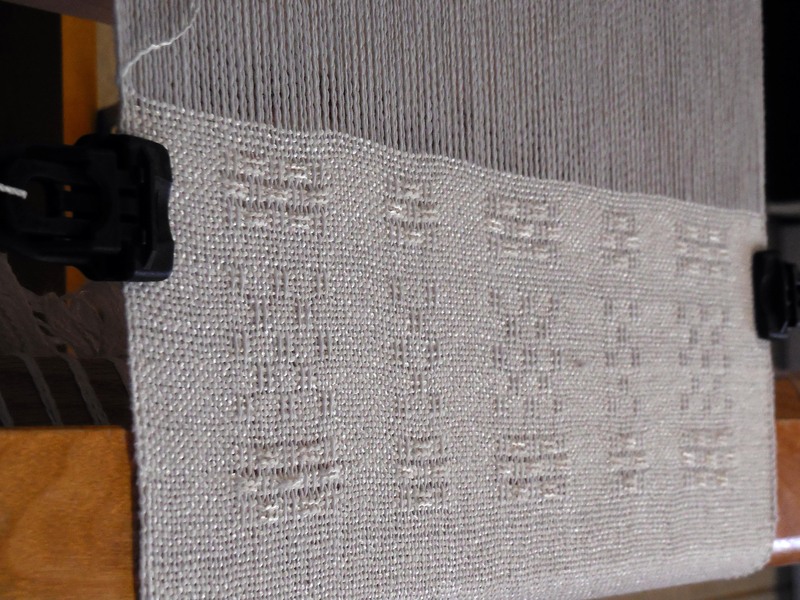 Look below to see a gallery of photos on warping the loom for the project. When a test of yarn and weave pattern is successful, we think, “Oh, Man, I could have gone ahead with the project and be done by now.” Right? Yep. Well, I finished my test and here is my comment: “Whew!” Lucky stars were counted. The beautiful white cotton/rayon yarn I chose would have been a disaster as curtains. My samples were sturdy and heavy enough to use as bath mats. Bath mats hanging on my bedroom windows? I don’t think so. I loved the huck lace pattern, though, and while I wove the sample, developed a huck design I will use in the curtains. (With another yarn, of course.) The samples will not go to waste. When I get trim sewn on the ends, I will have two very pretty bath mats, which were needed anyway. First, I must settle on a yarn which will work for my project. No problem there. Every weaver has a stash of yarn stored in the closet. If you are a weaver, you know this all too well. It is an easy choice between clothes and an addition to one’s already burgeoning supply of yarn. The yarn gets the closet and the clothes are either pitched out or find their way into a box in the attic, to be pitched out at a later date. Second, Amend the draw down and pattern plan. The newly chosen yarn is smaller so all plans must be altered. Back to the drawing board. I’ve made an Excel sheet for this planning and it is so fun to use. New figures for yarn yardage, etc. have to be made. Third, Warp the loom according to the new plan. Okay, here is the fun part. And the part I photographed for this blog. 1. Warp 3 Threads at a Time. 2. Warping Board Maxed Out at 11 Yards. 3. My method: Separate Warp every 2 Yards. This will keep one warp from clinging to another. 4. Three Warps Tied and Chained. 5. Move Cross and Lease Sticks Behind Reed. 6. Tie Beater Bar Upright. Jugs shown are too heavy. Fill jugs 1/4 to 1/3 full for adequate tension on Warp. 8. Begin to Wrap Back Beam. 9. Warps in Groups of 3 Under Tension Travel to Back Beam. Wound on with a Trapeze, Warp is tight and straight. Wraps on Back Beam are separated with Sticks. Rope Extensions added to Warp keep it Under Tension while winding on as much as you can. All Warp on Back Beam. Ready for Next Step. Judith… you are so talented! Thank you so much. I’m happy you like my work.